I won’t say what happens next, but it does not end well for the cat. Mixing with moments of sweetness, uncompromising shock, violence, and humor, the reader’s own (hopefully) more healthy perception of reality becomes a character in and of itself, both enjoying and struggling with Goudreault’s protagonist. 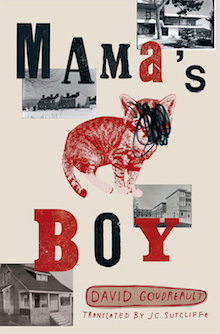 Mamma’s Boy is dark and twisted, but it is also incredibly amusing and raw. David Goudreault is a Quebecer writer who won the first World Cup of Slam Poetry and has received awards such as the Grand Prix littéraire Archambault for this very novel.